Ever since I read this article in the New York Times I have been wanting to roast radishes. I made a slightly different version than the crostini in the article and discovered that these little radish toasts make a wonderful appetizer for a party, large or small. Radishes are in season right now, so it’s very inexpensive to cook with them. Whether you are making toasts for a party or just roasting some radishes yourself, I highly recommend this new approach to radishes! Slice fresh loaf of french bread into slices about 1/4″ thick. Heat up pan with pat of butter and olive oil. Lightly toast both sides of bread until golden brown. Remove from pan. Rinse radishes well in cold water, removing all dirt. Cut off tops and bottom roots. Quarter radishes, toss with olive oil and salt. Roast in oven at 425 for about 15 minutes. Let radishes cool. 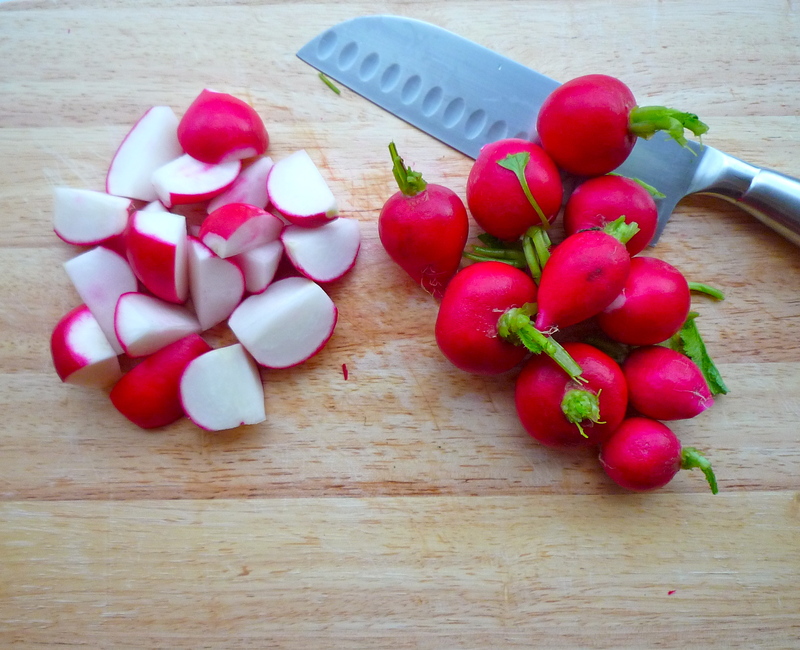 Once radishes have cooled, slice radish quarters into thin slices. 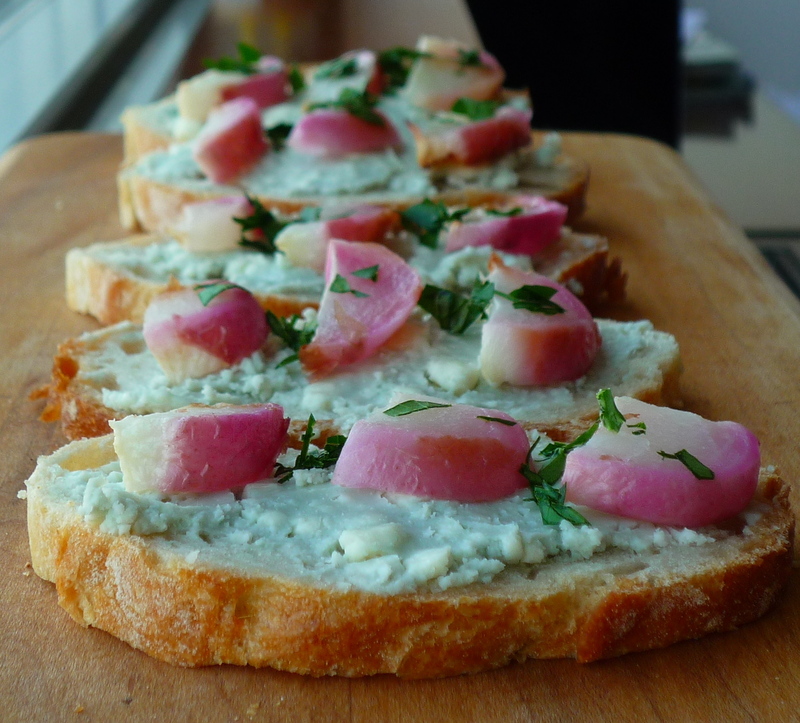 There are several options for the spread on these radish toasts. You can keep it simple by using butter and salt. I used a little blue cheese. The radishes loose all of their bite when they are roasted and have a very mild flavor. I mashed up some blue cheese crumbles into a paste and spread it on the toasts. If you don’t like blue cheese or butter I recommend spreading a little goat cheese on the toasts instead. When you are done spreading cheese onto toasts, top with radish slices. Finish off the toasts with a little freshly chopped parsley. I am really curious how this recipe will turn out! It sounds very interesting. I have to try it. also, in the name of toast, a new favorite: crab toast at ABC Kitchen. to die for.